Harmonia Island, a beautiful locale frequently migrated to by all known Pokemon with many areas of all sorts for the students of Gray Garden Academy to explore. Students have the choice between five different dorms, each specializing in different types of Pokemon. With a flourishing resort city near by there is never a dull moment on Harmonia and always a chance to prove yourself to your fellow classmates. 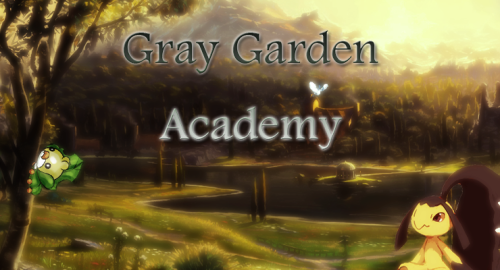 Gray Garden Academy is a Pokemon Academy RP whose formula has been polished and nearly perfected after several incarnations. It features a simple to use battle system to keep things fast paced and interesting without losing the balance that is necessary. It also features an easy to use evolution system. No level-up systems whatsoever! Students can participate in monthly tournaments, go on missions alone or with other students, go to classes, participate in the Academy's special "Gym Challenge," or simply RP it out with the rest of the community. Other prominent positions include teachers and faculty which teach classes among other things, and Dorm Wardens which act as the student overseers and Dorm Leaders for the Gray Garden Gym Challenge.